For many days now there has been a special energy in the air as San Miguel prepares for Christmas, a major event in this largely Catholic country. The colorful flags that traditionally grace our streets during festivals have been replaced by strings of small white lights, and all of the parks and gardens have been planted with an abundance of poinsettias, known in Mexico as La Flor de Noche Buena, the Christmas Eve Flower. (Parenthetically, poinsettias are indigenous to Mexico and Central America and were first introduced to the United States in 1825 by Robert Poinsett, the first US Minister to Mexico; hence the name, “poinsettia.”) Houses and walls have been repainted, streets cleaned, and there are decorations everywhere. Some streets have been closed to traffic to make room for the many makeshift booths and tents that sell everything remotely connected to Christmas. I was interested to observe a kind of time line: first there were Christmas trees and poinsettias everywhere. Then a few days later, all the things one would wish to put on a Christmas tree began to appear in the markets and stalls, together with hundreds of piñatas. A week later an entire side street was closed to traffic and devoted to the various traditional contents of a piñata, i.e., candy, peanuts, sugarcane, fruits, etc. And then the poinsettias were all gone, replaced by mangers and manger inhabitants; now its moss and bromeliads and straw and other materials associated with the construction of a manger scene. I have read that the representation of the nativity dates from the 13th century and is attributed to St. Francis of Assisi. In Mexico the manager scene, known as El Nacimiento, is the principal holiday adornment and while the poorest family may not be able to afford a Christmas tree, virtually every family will set up a creche in their home. Since 1960, a life-size manger scene has been erected in the Jardin Principal, the main garden at the center of town, and when we walked by this morning it was almost finished with Mary and Joseph in place. It should be completed later today and will include live animals. The baby Jesus will not appear until Christmas Eve. Christmas preparations seemed to move into high gear on December 8th, the Feast of the Immaculate Conception. With just a hint of pink in the early morning sky, we were awakened by a cacophony of church bells at 6 a.m., interspersed with rocket fire, as the celebration began. Although theological controversy has long surrounded this festival, I had been unaware that it refers not to the conception of Jesus but rather to the conception of Mary by her mother, Saint Anne. The festival dates back to at least the eighth century and in 1854 was finally declared by Pope Pius IX to be an essential dogma of the Roman Catholic Church. Of course that celebration paled in comparison to what awaited us on the 12th, the Feast of the Virgin of Guadalupe, the patron saint of Mexico, also known as the “Empress of Latin America,” and the most famous and beloved icon in all of Mexico. 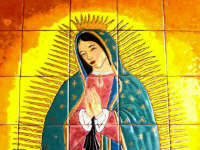 To Mexicans, she is THE MOTHER. This is her story: In 1531, an indigenous man, Juan Diego, was on his way to church when the Virgin appeared to him on Tepayac Hill, near Mexico City. She instructed him to tell the bishop to build her a church on that spot. But poor Juan, being only an Indian, could not convince the bishop he was telling the truth. So the Virgin appeared to him again. At her feet, Spanish roses grew, even though it was winter. She told him to wrap them in his cloak and take them to the bishop as proof of the miracle. When he spilled the roses at the bishop’s feet, the brown-skinned Virgin’s image had been imprinted on the cloak—which is now in the Basilica of the Virgin of Guadalupe that stands on Tepayac Hill. In San Miguel, an image of the Virgin is mounted over the gate in front of the Parroquia. Late in the evening of the 11th, the mariachis gather and at the stroke of midnight they serenade her with the Mexican Happy Birthday song, Las Mananitas. The 16th of December was the first of nine consecutive nights of candlelight processions, known as Las Posadas, a tradition in Mexico for over 400 years and a tradition in San Miguel since 1737. Posada is Spanish for “lodging” or “accommodation” and each evening’s procession is a reenactment of Mary and Joseph’s quest for lodging in Bethlehem. Although there are variations, most often children personify the members of the holy family with “Mary” riding a real donkey or burro. As the procession moves along the street, many fall in behind, sometimes in costumes of angels or shepherds. By pre-arrangement, the procession will stop at various dwellings requesting shelter for the night and be turned away. Finally at the last stop they will be told that while there is no room in the inn, they may take refuge in the stable. The doors are opened and all are invited to enter. After the rosary is prayed, a traditional Christmas punch is served, Ponche Navideno, along with tamales and bunuelos (a deep-fried dough ball rolled in brown sugar and cinnamon); the evening ends with the breaking of a large piñata. Tomorrow is Christmas Eve, Noche Buena, and is the most important evening of the season and the occasion when the children open their presents. Incidentally, Santa Claus and the clatter of reindeer hooves on the rooftop are not part of a Mexican Christmas; rather the wishlist of a Mexican child is directed instead to el Niño Dios (the Holy Child) for Christmas Eve and the Reyes Magos (Magi) for Three Kings Day, Dia de los Reyes, January 6th. Tomorrow evening we have invited a few friends for dinner in front of the fireplace and Christmas Day will find us dining on another round of turkey. But the season will continue unabated with many celebrations yet to come including the Day of the Holy Innocents, Los Santos Inocentes, on December 28th, New Year’s, and then Epiphany. I can’t remember ever having had a richer holiday experience than this one in San Miguel. As the passing solstice has reversed the Sun’s ebbing presence in our sky, so may the coming New Year bring you increasing light and love. Happy days ahead. 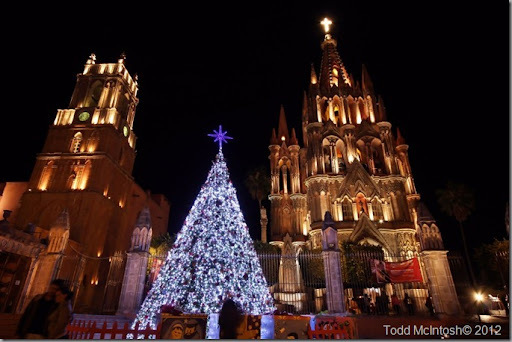 WOW, WHAT A WONDERFUL HISTORY STORY OF MEXICAN CHRISTMAS/ I AM SO HAPPY YOU L,OVE IT THERE. IT WAS ALWAYS ONE OF MY FAVORIT PLACES IN MEXICO/. WE HAD A NICE PRE CHRISTMAS DINNER WITH STEVE AND MARY THEY ARE SO HAPPY TOGETHER. WE THINK OF YOU AND MISS YOU AND ARE HAPPY FOR THE THREE OF YOU..HAPPY. AND A VERY HEALTHY 2013. LOVE THE SAUSALITO MOB..